The popularity of scoop bins of bulk or self-selected foods started in health food shops in the late 1980’s. What began with specialist niche lines grew so much in popularity, large supermarket chains picked up the concept and set up departments in their stores. 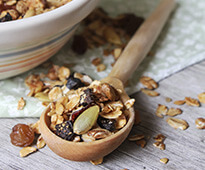 Consumers used to purchase large quantities hence the name, bulk foods. However, the quality and selection of products was poor and the department rapidly deteriorated. We felt our customers deserved better than this and we decided to create a brand that was based on goodness, honesty and integrity. Food you can trust! New Zealand’s best loved cook and author. Alison is passionate about good food and was a convert to self- selected foods having used them extensively while living in America. She was extremely disappointed with what was on offer when she returned to New Zealand and was excited about what we planned to create. 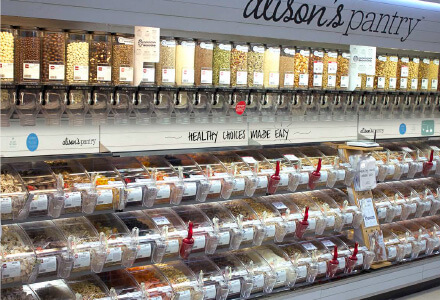 An alliance was formed that utilized Alison’s knowledge, advice, recipes and endorsement to create Alison’s Pantry and the wonderful selection of high quality foods available today. Alison has been called the ‘Mother of New Zealand Cooking’ and is known not only for her delicious, trusted, never-fail recipes and beautifully presented food, but for her helpful tips and ideas that make cooking easier. We translated this philosophy into the design of our bins and product range. We developed the attractive, user- friendly scoop bins to feature our carefully selected range of high quality foods. This quality was not previously available in bulk bins and to this day it remains generally superior to packaged products too. Our purchasing team searches the world for the very best foods we can find. We have introduced many lines previously not easy to obtain, and developed our own unique blends of fruits, nuts, snacks and cereals. We are enormously proud to have created a range of quality foods and Alison Holst is equally proud to endorse them.